Whilst working on compiling a plants list for my clients in Baldock I visited Wimpole Hall Walled Garden for inspiration at the weekend and I wasn’t disappointed. 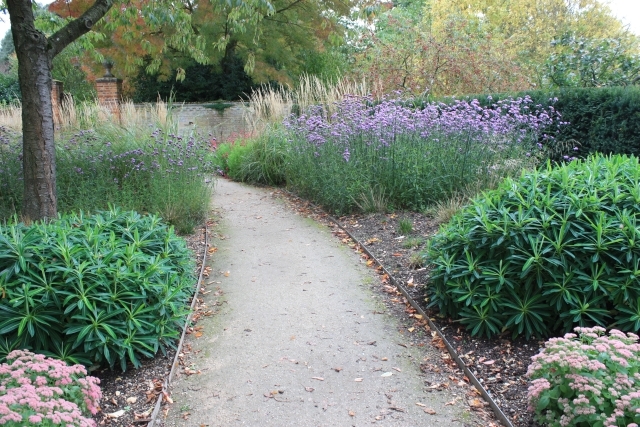 The use of large swathes of ornamental grasses in herbaceous borders was stunning and inspires me to combine tall form planting that will really move about on a windy day. This is exactly the feeling I’m after as I’m also creating a coastal feel garden and I want the plants to dance about. I can almost hear the ring tin tin of the masts on the hauled up sail boats on a beach somewhere, as they clang about in the wind. Miscanthus sinensis ‘Hermann Mussel’ (Eulalia ‘Hermann Mussel’) will reach a height of 1.8m and a spread of 1m after 2-5 years. 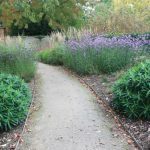 Architectural, City, Cottage/Informal, Flower Arranging, Beds and borders, Low Maintenance, Mediterranean, Prairie planting. Tolerates many conditions but prefers moderately fertile, moist but well-drained soil in full sun. Protect from excessive winter wet. Divide in spring. May be slow to establish after transplanting. A fabulous companion plant, as seen in this photo I took, is the much loved Verbena bonariensis. PreviousWorking as a garden designer..